I stopped at a store yesterday, just to run in quickly and grab something. As usual, I was in a hurry. I had ten minutes between one appointment and another, and decided to maximize my time by squeezing in an errand. 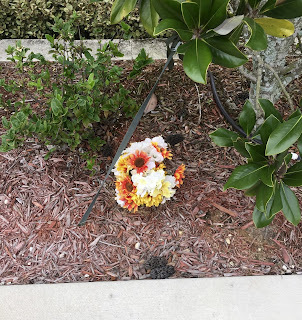 When I stepped out of my car, I looked down in the planter next to the parking lot and saw a bouquet of flowers. It's fairly unusual to see a bouquet of flowers stuck in an otherwise bland and boring parking lot planter. But there was this bouquet of flowers stuck in the ground in the middle of this planter, and I couldn't help but stop and stare at it. Upon closer inspection, I realized that, although it was colorful and bright, the bouquet was, in fact, not real. It was straight up plastic. Someone stuck a plastic bouquet of flowers in this remote area of a parking lot in the middle of a bland planter. They actually took the time to bury it, then arrange the mulch around it. I like to imagine them standing back and admiring their handiwork with delight. "Perfect! THAT'S exactly what that planter needed!" Where does the impulse to plant a plastic bouquet in a planter come from? I think it comes from the same place where all of our creative, generative impulses originate. Deep inside each of us there is this desire to make the world a better place, to create beautiful things, to leave our campsite better than we found it, so to speak. But most of the time we are too busy, too preoccupied, too self-involved and self-centered to give in to those impulses and simply do what God has always intended us to do--to join him in making new things, restoring that which was lost, and resurrecting what has been left for dead. May you live into the hope of the Resurrection during this season of Easter by giving in to the creative, generative impulses that are part of the God-DNA within you. Plant beautiful things, speak grace and peace into the world. Join God in co-creating a new world, a new kingdom. And may the grace and peace of the risen Christ be with you now and always. Amen.